Arizona is the mecca for gorgeous stone floors. From marble to travertine, nothing can make a home look and feel like a palace like natural stone flooring can. But being a “soft” product, natural stone loses its luster and brilliance over time due to abrasion damage from dust and debris under foot that create millions of microscopic scratches which don’t allow the light to reflect properly. DOCTOR STEAMER, LLC is IICRC certified in proper stone cleaning methods. check out our FAQ section under the About Us tab for more info!
. In addition, contaminants and oils can penetrate the surfaces of the porous stone, giving the impression of staining and dulling. 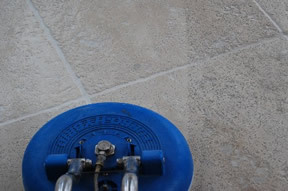 Regular professional cleaning of natural stone can extend the life of the shine by removing these oils and debris before they can cause damage to the surface. Floors are carefully inspected for stone type, cracks, pits, lippage (uneven installation), stains, and any pre-existing damage or areas of concern. Customer is given cleaning, polishing, and sealing options and suggestions. All stainless steel appliances and baseboard cabinets are protected with plastic. Wood floor transition points are protected with plastic or paper runners. Floors are cleaned with stone-appropriate solutions, followed by Hot-Water-Extraction to remove all residues and contaminants from surface and in natural pits and pores.